Anadolu Agency, a state-run media outlet, reports similar numbers. Parties need at least 10 percent of the vote to win representation in Parliament. 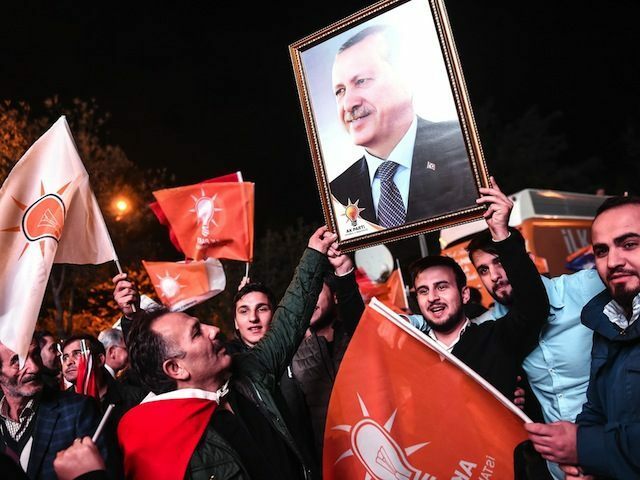 Last June, the HDP reached that threshold for the first time, receiving 12 percent of the vote and being largely blamed for the AKP’s inability to win a majority of the votes, forcing it to choose between building a coalition government with another party or staging another election. After failing to build a coalition government with the MHP, the AKP scheduled an election for November 1. The drop in votes for the HDP, threatening to eliminate them from Parliament entirely, triggered clashes in the Kurdish-populated city of Diyarbakir, where the party has garnered much of its support. Turkish police used tear gas and water cannons against protesters in the city following the gradual release of election numbers, which eventually revealed the AKP’s projected return to power. The clashes appeared to begin in front of the HDP’s Diyarbakir office. The HDP, whose leadership has claimed they were the targets of up to 400 attacks in the span of two days in September, mostly by AKP supporters, canceled public rallies for their candidates out of safety concerns. Candidates, the AFP reports, resorted to door-to-door campaign to get their message out without congregating supporters and potentially creating a target for terrorists. The deadliest terrorist attack in post-Ottoman Turkish history, the October 10 Ankara suicide attacks, targeted leftist Kurds and HDP supporters. Supporters of multiple opposition parties, meanwhile, have accused the AKP of being behind attempts to manipulate the election results. A Twitter account run by the anonymous “Ankara insider” Fuat Avni tweeted on Sunday that the AKP had organized multiple meetings with election officials to ensure the AKP’s victory on Sunday. Avni predicted that the AKP would ultimately received 55 percent of the vote, as designated by AKP officials orchestrating the fraud. 13. Thieves will receive legal support at polling stations. The priority is to steal MHP’s votes. Fuat Avni has previously claimed that the bombing of a group of Kurdish humanitarian workers in the border town of Suruç in July was a “false flag” operation designed to give the AKP an excuse to bomb the Marxist terror group the Kurdistan Workers’ Party (PKK) in Syria and Iraq. Despite being an anonymous account, the Turkish-language Fuat Avni account boasts more than two million followers and has been quoted in major Turkish newspapers. In addition to the Fuat Avni rumors, a chief adviser to the CHP told Turkish newspaper Zaman that the party is concerned that more than 600,000 names disappeared from the voter registry between the June and Novemer elections, and more than 400,000 have been registered as new voters. There is no information regarding the party affiliation of either group, but the CHP remains concerned these changes could affect their turnout.